“Worldly pleasures are insubstantial, whereas devotional joys are substantial.” This scriptural insight is most relevant for us spiritual seekers because it empowers us to resist material temptations. But unfortunately, we often forget it when temptation attacks us. We become like warriors caught unarmed by an enemy. Normally, warriors would immediately try to get a weapon for defending themselves. But if the enemy somehow deluded them into forgetting the weapon, they would soon lie butchered. The Bhagavad-gita (04.42) compares spiritual knowledge to a weapon. Temptation catches us unarmed when spiritual knowledge, specifically the insight for exposing that temptation, is not in our consciousness. We would normally try to remember that insight, but sometimes the temptation so bamboozles us that we don’t even remember to remember, and soon our moral resolutions lie butchered. To protect ourselves, we can use external aids such as reminders. We often use digital reminders for our to-dos. 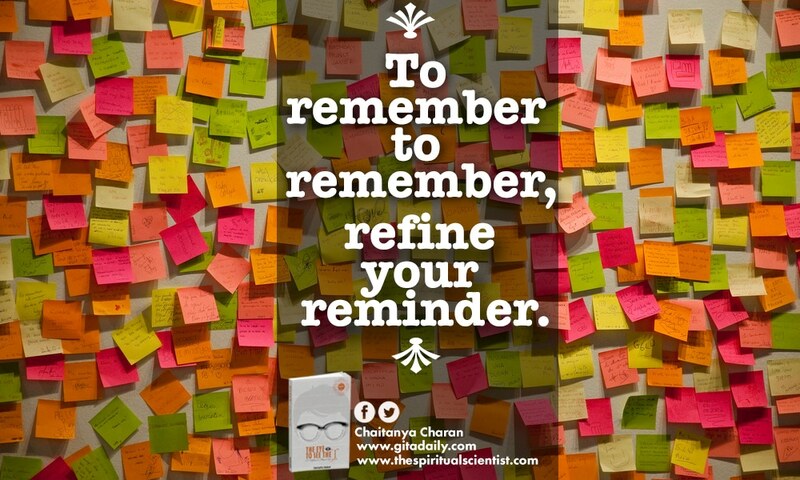 But as seekers we need reminders for not just our to-dos, but also our to-remembers. One standard reminder is a daily habit of scriptural study. However, because scripture deals with many subjects, generic scriptural study may not provide daily the specific reminders we need. So we can prepare for ourselves customized reminders such as verses, quotes and phrases composed of philosophical insights that unmask the particular temptations which bedevil us. Yes, it is – and it can manifest as philosophical insight too. But whatever way it manifests, to receive it, we usually need to seek his help; and for that, we need to remember him; and for that, we frequently need to remember the philosophical rationale for remembering him. And that rationale often comes best from customized reminders. Thus, by refining our reminders, we can combat temptation and progress firmly in devotion.